Much more than just another cookbook, this unique cookbook is a first of its kind, containing a wealth of information. 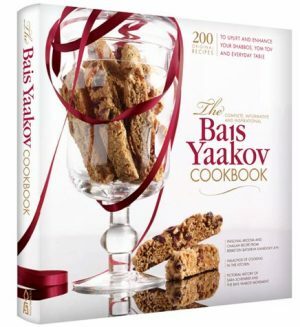 • 200 original recipes with stunning, full color photography • A personal brocha and challah recipe from Rebbetzin Batsheva Kanievsky a”h • A pictorial history of Sara Schneirer and the Bais Yaakov movement • Comprehensive section of Halachos of cooking in the kitchen • Guide to complex brachos situations • Color guide to checking fruits and vegetables • Tips on shopping for, preparing, and serving gourmet meals • Comprehensive guide to shopping for meat, wine, cookware, etc. This special cookbook belongs in the kitchen of every home!